Ten years ago, the Indian Ocean Tsunami was triggered by one of the largest-ever earthquakes. With a mind-boggling magnitude 9.1-9.3 on the Richter scale, it lasted for a record ten minutes and literally shook the world: vertical earth movements of 1 centimetre or more were recorded on the opposite side of the globe. The consequent tsunami waves raced along at 800 km/hour, cresting at over 30 metres on landfall. This was the deadliest tsunami in history, killing some 230,000 – 280,000 people across 14 countries, displacing a further 1.75 million, and wreaking destruction and damage costed at US$10 billion. But it was not just malevolent nature that broke records. So did humanity in terms of the biggest acute disaster response ever mounted with US$14 billion in contributions from 99 countries, many of which had never before given any international assistance. My own involvement started in the very early hours of 26 December 2004 when the bedside phone at my UK home rang. “Go away… I am not playing”, I snapped at Rob Holden, my associate at the World Health Organization calling from the operations control room at its Geneva headquarters. Burying my head under the pillow, I grumbled, “Is this your revenge?” remembering the emergency response drill that I had organised a few years earlier that had got Rob and my whole team at the Department for International Development out in the middle of a wintry weekend. “It’s not an exercise,” replied Rob. “Don’t you know what has happened? Put on your TV. And David wants you on the first plane back to Geneva”. David Nabarro was our much respected but fierce boss in the WHO Emergency Health Action Department. And that is why, a few days later, I found myself circling over Banda Aceh, staring through the portholes of a C130 plane of the Japanese Self Defence Force. This was also unprecedented as the first time since the Second World War that the Japanese had deployed military assets overseas. Below me stretched out an apocalyptic panorama – an eerie duplicate of the exhibits on the atomic bombing of Hiroshima that I had visited two years earlier. This was unsurprising: the surface energy released by the earthquake was an estimated 23,000 times greater than that atomic bomb. A muddy tide of broken-up furniture, smashed cars, and crushed concrete structures coursed through the pulverised town, depositing dead animals and humans along the way. A large cargo ship was marooned half way up a hillside. Ikawati from Indonesian government liaison was waiting for me when I landed. Slight in form but firm in her grip of my arm, she steadied me as we slithered to our mud-encrusted Landcruiser. I got to know her well as she coordinated local relief operations. But it was more than a week before she opened up on her personal tragedy. She had herself lost everyone in her family – husband, children, and parents. I marvelled at her gritty determination to keep going. “For my people”, she said simply. Budiman, my driver, was an ex-fisherman who had also lost all his family. He survived because he had been out on the ocean where the tsunami waves were no more than a rough swell. It was only when he could not recognise the shoreline on his return that he realised what had happened. There were many like Ikawati and Budiman, such as the chair of the local Red Cross who lost all his members and volunteers but started to rebuild his chapter immediately. “Because we are needed”, he said. They transformed their personal grief into a frenetic force to help others. As with all disasters, it was the locals who were the immediate and most effective saviours. I figured that it was best to let them get on with it while I helped steer the squadrons of international workers that were arriving, eager to spend the billions that a global public had donated. Too much generosity can be overwhelming. So I spent my time settling turf disputes such as between two medical organisations determined to run the same hospital, or trying to decide on what to do with the shipment of used – and still soiled – clothes in gigantic North American sizes that the petite people of Aceh examined with bewilderment. And what to do with the benevolent contribution of a container load of Viagra consigned to “Dr Kapila, WHO representative”? That particular problem was solved, much to my own relief, when these drugs just disappeared overnight – “liberated” said my local colleagues with knowing looks. Earlier on, Rob and I had split the work: my rank in the United Nations system and accompanying grey hair meant that I was better positioned to handle the politics of international do-gooding while Rob – a nurse with a useful naval background – was installed on the aircraft carrier USS Abraham Lincoln. I sat alongside the two star admiral that commanded the multinational Operation Unified Assistance, from the Royal Thai Airbase at Utapao, negotiating the daily tasking for the Abraham Lincoln as it steamed up and down the Sumatra coast. Our instructions were passed on to Rob who coordinated joint civil/military sorties to give immediate aid and conduct assessments in areas inaccessible except by helicopter. Thus, we built up a picture of the extent of the devastation and its human impact. And, undoubtedly, many people were rescued and lives saved. A blue enamelled mug has rested on my desk for the past ten years. The repository of stray paperclips and dried-up ballpoints, it carries the proud slogan “Shall not perish”. 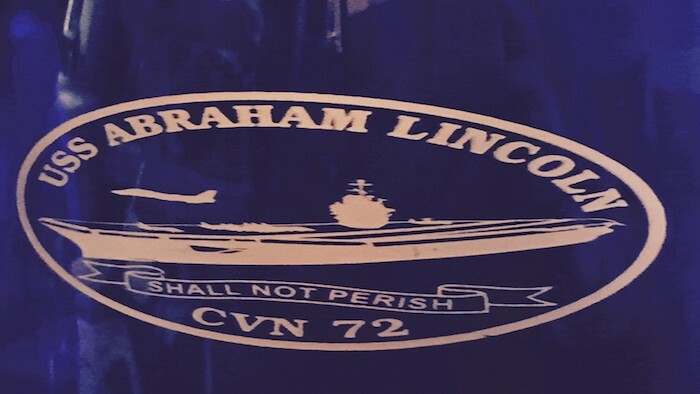 A gift from the commander of USS Abraham Lincoln to commemorate our collaboration, it serves as a daily reminder of the power of organised humanity when driven to work together by shared compassion. It is also a reminder that the humanitarian instinct – the desire to help others – is innate in all of us. Chaotic and undisciplined at times, much to the despair of aid bureaucrats, it is the essential essence of all great humanitarian endeavours. Mukesh Kapila is professor of Global Health and Humanitarian Affairs at the University of Manchester, chair of Nonviolent Peace Force, and chair of the Manchester Global Foundation. He is also Special Representative of the Aegis Trust for the prevention of crimes against humanity. Associate Fellow at the Geneva Centre for Security Policy and adjunct professor at the International Centre for Humanitarian Affairs, Nairobi. Formerly, he was Special Adviser to the World Humanitarian Summit, Undersecretary General at the International Federation of Red Cross and Red Crescent Societies, United Nations Resident and Humanitarian Coordinator for the Sudan, Special Adviser to the UN High Commissioner for Human Rights, and Head of Conflict & Humanitarian Affairs at the UK Government Department for International Development. He can be followed on twitter at http://www.twitter.com/mukeshkapila. He is the curator of the Flesh and Blood blog on E-IR.